A very cute darning needle set in a cute, knitting needle shaped, case. 2 needles/set in a package. 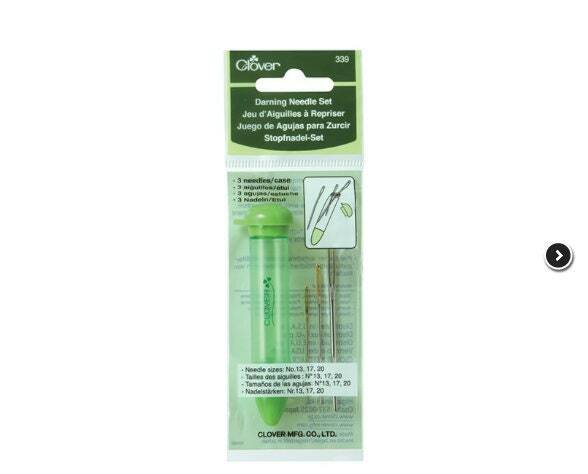 Use your Chibi Darning Needle Set to weave in the ends of yarn when I completing a knitting , crochet, weaving project, to weave elastic cord into tops of socks, cuffs of sweaters, etc. We even use an assortment of them in the place of shuttles when creating small tapestry weavings. They make very detailed weaving much easier! The bent tip is the crux of this gem of a tool. Weaving through the stitches on knitted projects or the warp of a tapestry loom becomes much, much easier than with a straight tipped darning or yarn needle.